What the city of Cleveland taught us about perseverance. COACH DANA CAVALEA, Pro Speaker.TrainLikeAPro.Performance Coach of Pro Athletes, CEOs, Execs, & Leaders. World Series Champ.I Develop Winners.Former Yankees Coach. Call Me Coach. I never spend much time staying in bed once my eyes open in the morning. It is usually full steam ahead after my first deep breath. Today was a different kind of day. Yesterday, before heading to dinner I was reading a great book called Positivity by Barbara L. Fredrickson that is based on academic and practical research, discussing Positive Thinking and how utilizing tools/thoughts/actions like giving gratitude, taking pride in your work, inspiration and having hope can change your day to day outlook on your life. So you want to know my reason for staying in bed this morning? An ESPN 30 for 30 documentary. This brings me to the city of Cleveland, Ohio… circa 2015/2016. Every person I have ever met from Ohio has an incredible amount of Ohio state pride — even more than those from New York and Texas — believe it or not. The people of Ohio are hard-nosed, blue-collar, work-horses.. truly capturing the American spirt of the old world. For those that want to know about the city of Cleveland- for a long time it was a city that was definitely been beat up and ravaged by the closure of American Industry, a downtown that looked as if it was the cousin of a desolate Detroit.. it was definitely a city in trouble. But the one thing I know about Cleveland, is that they love their sports teams. The Browns — — a team of poor results was their football team. Art Modell their former owner actually moved the team to Baltimore, suspending football in Ohio from 1996–1999 — taking all the wind out from under the Cleveland faithfuls wings. This was somewhat like a funeral for a sports team if you watch some of the fan interviews. What I have always found so amazing about sports is that sports can bring people together like nothing else. As your stock market is crashing, it is sports like horse racing that give people hope. There are incredible stories of HOPE and Perseverance that come from sports. There is always that story within the story. As Barbara wrote in her book- “hope comes into play when your circumstances are dire”; that was Cleveland from a sports, morale, and economic standpoint. Hope is about realizing no matter how awful a situation may be.. things can and will turn out better. Then there is INSPIRATION. Transcending the ordinary, seeing better possibilities than usual. 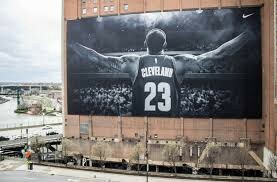 For Cleveland, that source of HOPE & INSPIRATION that not only sparked the morale of the city, but also re-stimulated the downtown economy came packaged within a 6 foot 8 High School Student out of St. Vincents/ St. Mary’s by the name of Lebron James. Watching today’s 30–30 virtually brought tears to my eyes — watching a city in “pain” become resurrected with joy, hope, and inspiration as a result of basketball player that gave it everything he had. Life is similar to the city of Cleveland. You will have ups and downs… we all do. It comes down to how you deal with things. How you handle the stress and conditions that are presented to you. You must believe (Believeland). You can be the Lebron James to a household, team, organization, or company- but only if you believe you can be whole-heartedly. I have been saying it for many years now.. “People need hope and inspiration…it can come from so many different places.. but hope and inspiration are essential ingredients to man-kind”.. be the hope and inspiration for somebody in need. Write, speak, visit, sing… but do something to inspire somebody else.. and in turn.. you will feel the gratitude of your work. You will start to see things change around you for the better. Give of yourself and your world will truly start to change. Take the focus off of yourself and your world will start to light up. For many athletes- their whole life is about themselves. That is the reason many are inspired to start charities as they move through the ranks — they realize there is more to life than receiving.. and with giving comes a feeling of fulfillment that not even a 5 year/ 100 million dollar contract can buy you.